Hey everyone! We have some exciting news for you all! But we can't tell you just yet! Such a let down, right? Anyway, we're going to jump in with this week's Kickstarter Weekly, and there's some cool stuff to check out from some of our favorite publishers and designers, so let's get crackin'! Our good friend Jason Tagmire is back with another deck of Storyteller cards. Storyteller cards serve as a regular deck of playing cards, a creative tool, and a way to teach creativity to young gamers - think story dice. Along with the cards, your pledge will score you the Storyteller Manual--in PDF form, or as an add-on--that will have games designed by some fantastic designers specifically for the deck of cards you'll be getting. The first game announced is Divvy In The Dungeon by the one and only Jason Kotarski, you may know him as the guy who designed a TOG favorite The Great Heartland Hauling Co. And who has a few more games hitting the market this year with Crash Games! With more to come, this campaign is super inexpensive to get into and packs a lot of potential; we think you should jump on board! By Firestone Lately I've found myself getting completely hooked by small games with big gameplay. The Resistance. Hanabi. And now Coup. 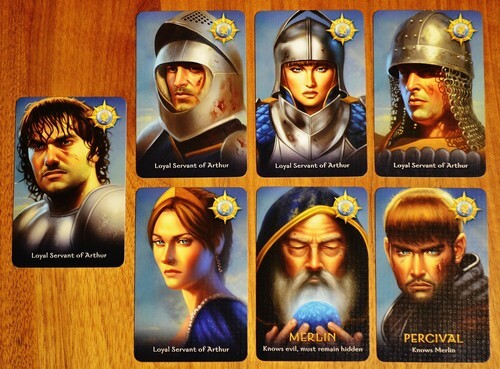 15 cards—five characters (Duke, Assassin, Captain, Ambassador, Contessa) repeated three times. Now, there are a few different printings of this. The components might be slightly different—and the art is certainly different—but that's what you'll be playing with. Place the pile of money in the center of the table. Give each person two dollars. Have each person draw two cards, look at them, and place them facedown in front of them. Collect Income—which means taking one coin from the bank. Nothing can stop you from doing this or affect this in any way. Collect Foreign Aid—which means taking two coins from the bank. Why would someone Collect Income when they can Collect Foreign Aid? I'll tell you in a minute. Coup—Pay seven coins and launch a coup against an opponent. That opponent chooses one of their facedown character cards and discards it faceup. Nothing can stop you from doing this or affect this in any way. Use the Special Power of a Character—Each character has a special power, and you just do it. The Duke allows you to take three coins from the bank. The Assassin allows you to pay three coins to kill another player's character card. The Captain allows you to steal two coins from another player. The Ambassador allows you to draw two character cards from the deck, exchange one, both, or neither of the drawn cards with the character cards you already have, and then put two cards onto the deck. What's interesting is that you don't have to actually have that character card to do the Action... You can bluff your way into any action. So maybe I have the Assassin and the Contessa in front of me. When it gets to my turn I can say, "I'm going to take three coins, because I have the Duke." And that's just what I do. Unless...someone calls my bluff. Anyone at the table can say that I'm lying. If that's the case, one of us is losing a card. If I'm bluffing, I have to admit it, turn one of my character cards faceup, and I'm down to one "life." (You're out of the game when you have to ditch both characters. You've essentially lost your ability to influence people anymore, so you're thrown out to the dogs. Or something.) If I was telling the truth, I show that do actually have that character, the person who wrongly accused me has to ditch a character card, and then I get a new one: You place the card on the pile of remaining cards, shuffle them up, and draw one. It might be the one you just got rid of, and your opponents have no idea. That's one of the great things about this game. In addition to Actions, some of the characters have a Blocking ability. The Captain blocks someone from stealing coins from you. The Ambassador also blocks someone from stealing coins from you. And the Contessa blocks someone from Assassinating you. Again, someone can claim they have a blocking character even if they don't. And again, unless someone calls the bluff, the block happens. The last person with influence (a character) wins. The game is layered and tense and...poker-like, in a way. It's also very simple and elegant. Family Game? Maybe! Certainly not until they're older. Even then, I'm not sure this is something my wife would want to play. Youth Group Game? Possibly! It would depend greatly on the group. Gamers' Game? Definitely! Coup is a terrific gamers' game—especially if your group likes games such as The Resistance. The first time we played this, we played it five times in a row. And that was in less than an hour. I will say that this wasn't good with six players, IMO. There was too much information on the table toward the end--because so many characters were discarded--so it slowed down as people tried to figure out who their opponents might still have. Four players felt good, and some people said they thought it might be best with five. We also had a situation where three people were left, and all three had one character left. On one person's turn he was going to Coup someone, but whichever opponent he didn't kill would just kill him. So he was essentially in the position of deciding who won. Blech. That was my only complaint. I like Coup a lot, and I can't wait to get my hands on a copy. It's not going to replace The Resistance, but for a change-of-pace filler it's just completely awesome. So where can you get your own copy? Well, Indie Boards and Cards has a Resistance-themed Coup up on Kickstarter right now! It ends in two weeks, and it's way overfunded. And the best part? It's only $15 shipped. Check it out. It's no surprise that we love The Resistance here at TOG. So a new version with some special powers sounds great. Is The Resistance: Avalon as good as it sounds? Well let's find out. We're not going to explain the mechanisms of the game. You can read our review of The Resistance here, where we explain the game in detail. The new game is identical in basic gameplay; the difference is that there are roles in this game. The whole thing has an Arthurian legend theme, so the roles are characters from the mythology. The game seems to assume you'll play with at least the Merlin and Assassin cards. Merlin gets to know exactly who the Minions of Mordred are. When everyone's eyes are closed, the evil players raise their thumbs, and Merlin opens his or her eyes. So they have perfect knowledge in the game...but, they can't be too obvious about letting their teammates know who the baddies are, because at the end of the game, if the Servants of Arthur have won, the Assassin gets one last chance. He can talk things over with the other baddies, and then he assassinates the person he thinks is Merlin. If he's right, the bad guys win. Ever since I heard about that, I was troubled. It seemed awful that the baddies could win based on a complete blind guess. After playing, I'm less concerned. Usually the Assassin seems to be basing the decision on the way people acted, but there have been a few times when it's a blind guess that happens to be correct. It's really frustrating. Yes, the Loyal Knights who aren't Merlin need to be doing more to make themselves seem like Merlin, but that doesn't take the sting away. Mordred is a Minion of Mordred (duh). He doesn't reveal himself to Merlin at the beginning of the game. Oberon is a Minion of Mordred, but he doesn't show himself to the other Minions—nor does he get to know who the other Minions are. Morgana is a Minion of Mordred, and she gets to show herself as Merlin when Percival is in the game. So both Merlin and Morgana will have their thumbs extended, but Percival won't know which of them is Merlin and which is Morgana. Firestone—The first thing I have to comment on are the components. First, a couple of the cards have a misprint on them: the word unknown is spelled unkown. This is a small mistake that doesn't affect the game at all. It's just shocking that it wasn't caught. The other problem is this: Instead of voting cards, as you have in the original Resistance, you have tiles you vote with. After just one game, these were showing considerable wear—and after many games they're in awful shape. I'm not sure why they went with tiles over cards, but it seems like a terrible idea in retrospect. Jeremiah—I couldn't agree less! The first thing that I loved about the new version of the game was the tactile feel of the new voting tiles; it seems to streamline the hands-on feel and it's easier (along with the Leader tile) to keep track of each different component and stage of a round. With the first version, cards always seem to get shuffled into the wrong pile or mixed up, etc. The durability of the tiles is questionable, but even my sleeved cards from the first set are showing signs of wear (and they don't fit in the box as well). I also really enjoyed the new set of tableaus that are included. There is now a separate tableau for your game dependent on the amount of players, and each quest is labeled with how many knights are to go on that particular quest. It again streamlines the gameplay and requires less squinting from across the table to see how many folks you are selecting for the next quest. Firestone—Madness! :) But I do agree about the tableaus. Those are super helpful and convey just the sort of info they need to. Oberon creates some fun situations: In one game I was Merlin, so knew the baddies, but didn't know who was who. At one point a baddie put two Minions on a mission and I realized he had no idea he'd done that because one was Oberon. Of course, I voted that mission to go because I was more than happy to see them both on it; even if it failed they would almost certainly both vote to fail it, and now the group had a lot of information. The problem was that everyone noted that I'd voted for the failed mission to go forward, so now I was suspect! At any rate, I liked the mayhem that character caused. The Lancelot promo comes with a few variants, and we've only played one so far, but I didn't like it. Two people are dealt Lancelot cards—one of which is a Minion and one of which is Loyal. You play as your card, just like normal, but starting on the third mission you draw cards from a deck and there's a chance the loyalties will switch. Sounds cool, but if you're on the last mission, and your side is about to win, and you suddenly have to switch to the losing side because of a card flip? Blech. What should have been interesting was just frustrating for whomever was winning (and now suddenly wasn't), and a cheap victory for the person who was losing, and suddenly wins. Jeremiah—We haven't delved too deeply into the different roles; it is stressed very clearly in the rules that you shouldn't start adding more roles to the game if there are too many new/inexperienced players in the game, and as of yet, every time I have played there have been several folks new to the game. And grasping the roles, along with Merlin and the Assassin and how to play off of those roles, is quite the task, without muddying the waters too much. Firestone—Overall, this is a mixed bag for me. I like this version better than regular Resistance. But I don't think I like this better than regular Resistance with the plot cards. You can play Avalon with the plot cards from the original game (we haven't done that yet), but it makes no thematic or aesthetic sense to mix the two. I'm not sure why they didn't create plot cards for Avalon that fit that theme. They could be the same exact ones, just with new names and art. I'm glad I have both, and we've certainly been playing Avalon exclusively since we got it, but I wouldn't be surprised to see us return to the original over time. Jeremiah—With this I agree; I thought I would be more excited about this game than I actually am. I enjoy the level of strategy that Merlin brings to being a good guy; in the original it becomes a chore to hide your disappointment when you've been dealt an operative role. Trying to figure out who Merlin is, and then act as if you are Merlin definitely makes it fun for everyone at the table. The absence of the plot cards is palpable, even more so is the stark contrast in the theme when you try to add them in. The way the plot cards are played is a HUGE part of my strategy when playing a baddie, so I would LOVE to see them re-themed and offered as an add-on sometime soon. 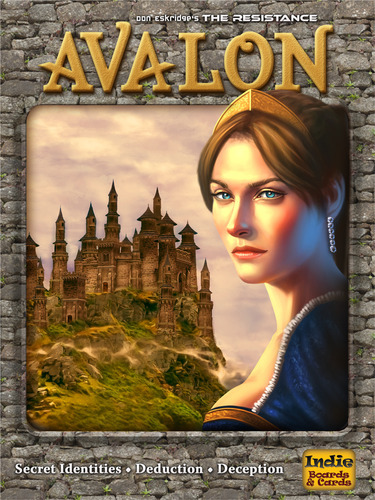 At its core Avalon is The Resistance, with more options and different aesthetics; I have yet to introduce the game to someone who didn't want to play again as soon as the first one was over. And Avalon is no different. Firestone Update—Well, we've played this a bunch more, and have had no desire to return to the original yet. Still lots to be explored with just the roles, and we're having a great time. I recommend this completely. This one's from the rumor mill--but it comes from a reliable source. The Resistance is getting an expansion! The owner of Indie Boards and Cards has swooped into a couple of threads on boardgamegeek.com, and hinted that an expansion will be going up on Kickstarter soon. He also said it won't just be more plot cards, but some new ways to play the game. We can't stop crowing about this awesome game, so more ways to play has us super excited. 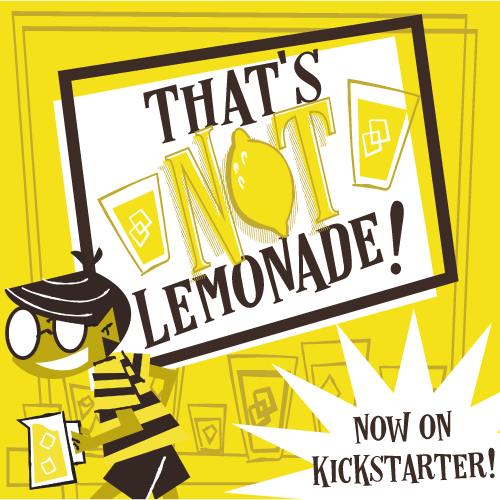 We'll keep you updated, and post a link to the Kickstarter project once it officially goes live. In the meantime, make sure you sign up to win your own copy of The Resistance. The contest ends tonight, and right now your chances are REALLY GOOD. Thanks for reading!